Following on, in a timely sort of manner, and because the Wellington wind has gone away and left us with some perfect walking / swimming / photo-taking weather, I thought it would be nice to have a look at the roof of the new Indoor Sports Stadium in Wellington. Most of you will have been sweeping past in your fast little cars, getting a sneaky sideways glimpse at the building while still trying to position yourself for the optimal angle at the roundabout. It is, as can be seen, a building designed to be seen at speed – and best navigated as a passenger rather than as a driver. Keep your eyes on the road, keep your hands on the wheel… Its even harder if you try to take a photo while you’re driving, so instead I took some time out to walk round and see the site from all sides. 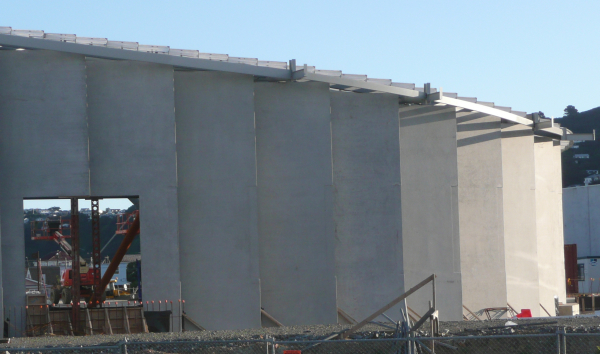 Large precast concrete fins are arrayed in a concertina manner around the perimeter. There is, as you have noticed, a gorgeous fresnell effect type thing going on, from dark to light as the sun plays across the frontage, with the gill-like blades of the facade fanning out across the view. Close up on those concrete panels, we can just make out a mysterious rectangular recess along the front edge of the fins, that must be there for some future purpose, perhaps a recess zone for slotting in a shiny metal edge strip, or something. Anybody have any idea what that is for? Anybody? I’m not quite sure how the inside of the building works – are we going to be able to see inside, and the insiders see out, or are they going to be cordoned off, and this end just a casual sports cafe with great view of motorway and Evans Bay? I suspect they will be marooned inside, away from the glare (and the view too, unfortunately), lit only by vast skylights or giant pendant fittings. There is, if you go round the outside, round the outside (yes, like a Buffalo Girl), a fantastic view of the structural machinations going on inside. As the concrete fins are obscuring the view from the north, and as the cranes move back into the hinterland of Rongotai / Kilbirnie, the full splendour of the roof is being unveiled. 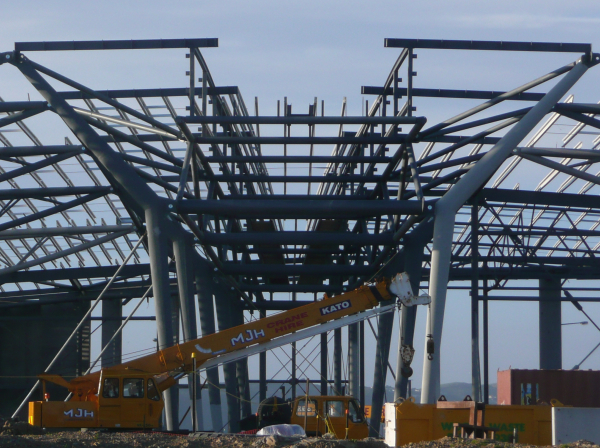 Just check out this steelwork, carefully fanning out of the steel support columns in an eccentrically loaded pair of cranked legs to pick up the roof trusses. Engineers SKM and Architects Tennant Brown – who ever is responsible for the design of those tied legs – they look fantastic. 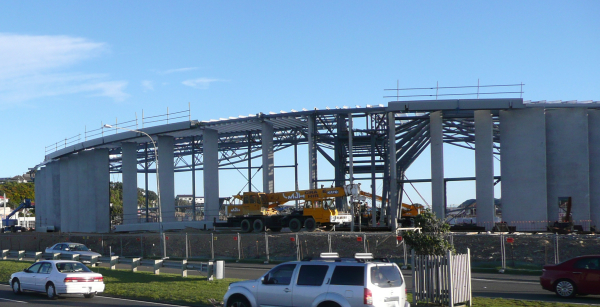 Mainzeal of course also deserve to take a bow for their work so far – it is proceeding at pace – and whoever is building that steelwork too – it looks great. The interior of this building will really be interesting to be in. I may even have to take up an Indoor Sport. What a pity that the Stadium people are all so sporty mad and won’t allow anyone else in there for other events. How incredibly dull and boring – while the central pillars do mean that it will never be that suited to a rock concert, it could certainly be useful for a myriad of other events. One of the more surprising things to come out of the whole Andy Foster public notification of the Stadium thing, was the traffic report at the time. Traffic Engineers, as optimistic as they are, concluded that there would be no adverse effects on the traffic in the area. Effects would be de minimus. So far, without the 300 / 500 school children using this space, they’re right. Give it some time once it opens, and we’ll see who is right then! 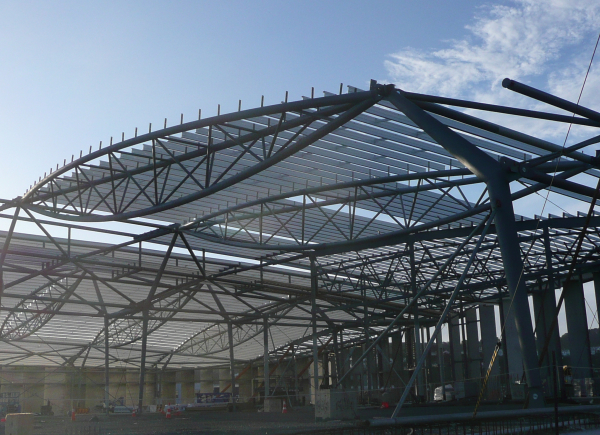 Anyway, politics aside, it is even more interesting to see at this stage is the roof structure itself. If this building doesn’t win every steelwork award in the country over the next year or two, I’ll eat my own tail. It is especially nice to see the steelwork at this stage of the job, before the roof goes on and spoils our outside view. But the array of trusses show the layout of the Stadium and the way the two sides of the courts are roofed over by these massive trusses. While there are any number of possible aquatic precedents for this building (and, while we’re talking aquatic, how much more interesting is this building than the strained ugly hunchback of the Kilbirnie Aquatic Centre! ), such as a manta ray gently undulating its way across the Miramar peninsular, I have to say that most of all it reminds me of the salmon swimming upstream on their way to spawn. 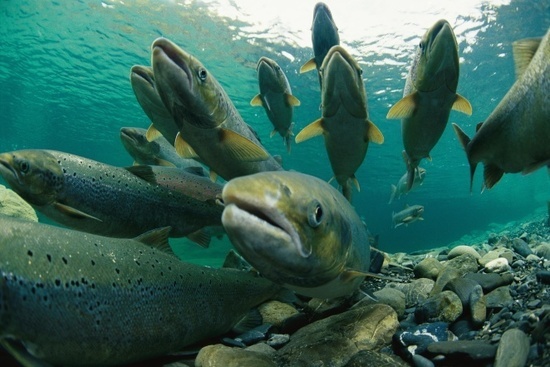 Mmmm, spawning…. But best of all, of course, is that the type of truss they are featuring is called a Fish-Belly truss, fso named for its gentle swelling and sagging undercarriage. I’m so honoured that the architects / engineers have so clearly set the structure of the humble fish at the heart of their building, a metaphor for a flock of our fishy finned friends. Fantastic! But, how much snow can it hold? Thanks for taking the time to explore that building. I drive past most days and have been wondering. The killer blow is going to be traffic congestion before and after events at the facility – it will be gridlock to and from the city which will also cause massive inconvenience to those wanting to use the airport and make check-in deadlines. The traffic report says No, there will be no discernable effects from traffic, ever, including at peak times. Personally, I don’t believe them and feel they have cocked up in a major way on that. I think their rational was that traffic was already bad at peak times, and the extra time stuck in traffic wouldn’t be noticed. At present, it is almost impossible to drive to from Cobham Drive. You actually really have to go from the Kilbirnie end, and so I’m predicting that there will be a lot of people who are new to the building who will go endlessly round the roundabouts searching for a way in. Obviously, new road layouts and new signage will fix that eventually, but I’d agree that at the first sign of gridlock at this point, people are going to be screaming for a different solution. Having just driven by that way, en-route from a drop-off at the airport, I have to say that I am absolutely appalled by this creation. Even when seen from the vantage and speed of a car it, the building dwarfs the natural scale of the area. As you round the first roundabout, and pass by the northern end of the runway, there it is – blocking out the hills with the quaint white bungalows dotted all over them. The scale difference is vast, and hugely troubling in that the design of the building is an unrelieved single lump, which is only, at the moment, halfway erected. I would have thought that Cobham drive, with its harbour views and celebrated sculpture series, might be considered a key processional route into Wellington – offering the first glimpses of what it is that makes this city special (harbour/hills/etc) – you know, that thing we call ‘sense of place’. How to destroy that possibility in one ill-conceived stroke. Aside from these ‘aesthetic’ concerns, there are the inevitable traffic woes mentioned above, as well as local resident concerns (we never heard about them, but they were upset by the limited number of carparks (to avoid RC), which means that, whenever a significant event is being held, the streets will be awash with cars from sundry other suburbs looking for driveways to park in front of… Not to mention expedient use of ratepayer funding, and so on. 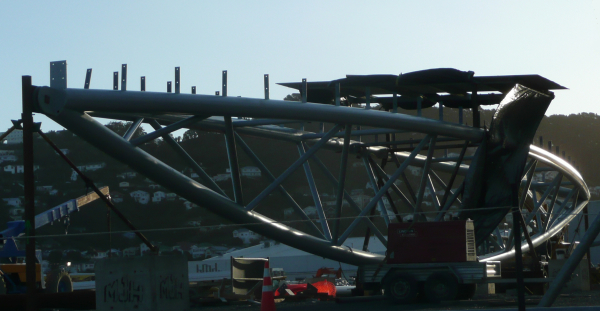 A few fish-bellied trusses are small compensation. I recall getting a lecture on this at architecture school… I’m pretty sure the ‘mysterious recesses’ on the concrete fins will have reflective red alucabond strips in them… Could be terrible, Could be sickeningly awesome! I guess only time will tell! Also, it currently looks great at night under the security lighting – it is a pity to close it in. The blocky roof edge detail isn’t something I’d choose – something more reminiscent of the stingray floating lightly above the fins might’ve looked better – but that’s just opinion… otherwise it looks to be a great addition to Wellington’s urban fabric. Agree with you Max in the likely effects on traffic…though there are some nice wind sculptures on the other side of the road to look at while stuck! It will be very interesting to see how well the inside space works for the spoty mad people using it as the alternating glare of panel and daylight might be bloody distracting. Greetings folks – regarding all the doomsday predictions above about the traffic snarl-ups, I stand to be corrected – but I’m sure that the way the stadium is run on a day-to-day basis will ensure that traffic disruption is minimised. This is all about the fact that for most of the time the facility will be used for school or club sports – and it’s not hard to stagger the timing of games/matches/call them what you will – so that everyone doesn’t arrive and leave the stadium all at once. I admire your confidence Mr MacLean. Will happily buy you a drink if you’re right ! Perhaps Richard expects the stadium to achieve the same usage as that other overblown amenity – the canpervan park on the waterfront. Perhaps the two extra staff were employed to look after an average of less than three campervans per day could fit sweeping the stadium floor in with their current not to onerous duties. Re: the campervan park. I live next to it, and noticed a large jump in the number of campervans parked there on Friday night. Am quite interested to see if the numbers increase as summer rolls in. Looks we have been beaten to the punch by your correspondent, Cat, but in terms of the campervan park, occupancy rates since we opened have been predictably low over the winter. Occupancy has increased noticeably in the past fortnight as we move toward summer and we expect it will only get better with the weather improving and the kick-off of marketing initiatives by Positively Wellington Tourism. Financially we are ahead of budget as those sites not used by motorhomes are filled with commuter cars on a daily basis and this requires on the spot management. 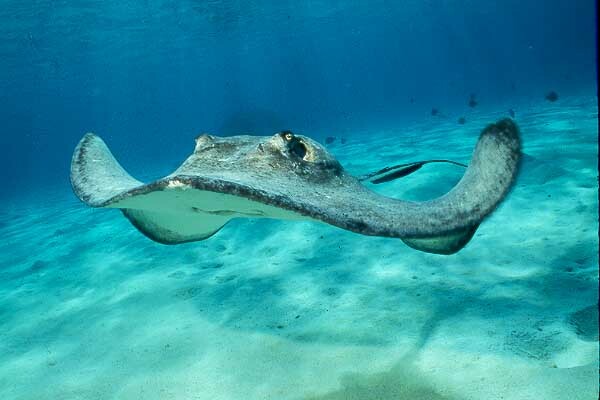 Max – just thinking about your analogy of the ISC to a manta ray …. and thinking of their favourite food (apparently, jellyfish), then what takes the place of the jellyfish in your analogy? Could it be those semi-glazed, partially transparent objects that scoot past its open mouth with regularity? Mr Maclean – you obviously don’t live in the eastern suburbs or routinely traverse city to airport via Mt Vic tunnel and/or Newtown/Kilbirnie; especially not on weekends. Your aspirations in regard to traffic volumes generated by events at this new facility are dreamland stuff. A pint and a pound says gridlock; you good for a wager here? Am inclined to agree. Traffic at the Cobham Drive roundabout is already nasty at the central Rongotai junction, with long lines banked up at peak times. Traffic exiting the Sports Centre will probably exit this way and make it a little worse. But conversely, traffic entering will choke up the other end, at Kilbirnie. Meh. What do I care? I don’t live there. Clog away! 11 campervans at 6pm Thursday night. 13 campervans at 6pm last night. Hmmm… campervan spotting. Wonder if it’ll catch on? right mobsta, we know where you live now. Do you have a view of the harbour? or are you on the street side? can we all come round on Guy Fawkes night to watch the show? Maybe the stadium could be a stop on a light rail/tram route to the Airport. Looked out my window this morning to see a woman (swedish by the hair colour) in her pyjamas and ugg boots walking across the campervan park to the shower block.